We have added a whole host of new information to our projects on damp and condensation. During the summer months you may not get too much problem with damp in your home, and the advantage of being able to open your windows means that condensation is less of a problem in the summer too. However spare a thought for those colder wetter days and use the summer weather to get out in the garden and check that your airbricks are clear of debris so they can work effectively. 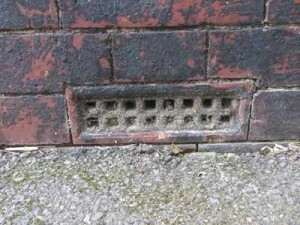 All properties with hollow floors should have air bricks built into the wall to allow a free flowing passage of air. However airbricks can become blocked or damaged over time, so if you have this type of floor, it is important to check that you have enough of them and that they are doing their job. Why Use Air Bricks in My House? Why do I need air bricks? How do I maintain air bricks? What do I do if my airbricks are too low? Air Bricks are special bricks that are manufactured with holes in them to allow the circulation of air under the floor of buildings with a suspended timber floor. The act of circulating air ensures that cold or damp air is not allowed to sit in any voids or empty space as . . . Read the rest of the article on Air Bricks in our DIY Projects Pages. When the air is prevented from freely circulating, condensation can build up underneath the floor and this can lead to dry rot, wet rot and can also contribute to insect infestation, as the little blighters soon move in on damaged timber. For more information on the causes of condensation and for a guide on how to solve condensation problems please see our condensation project. If you have a creaky floor then this may be the first sign that there is a problem with the joists, which could be caused by condensation and rot. Find out more about timber decay in our damp or mould project.